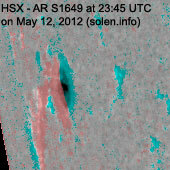 Last major update issued on May 14, 2012 at 04:25 UTC. 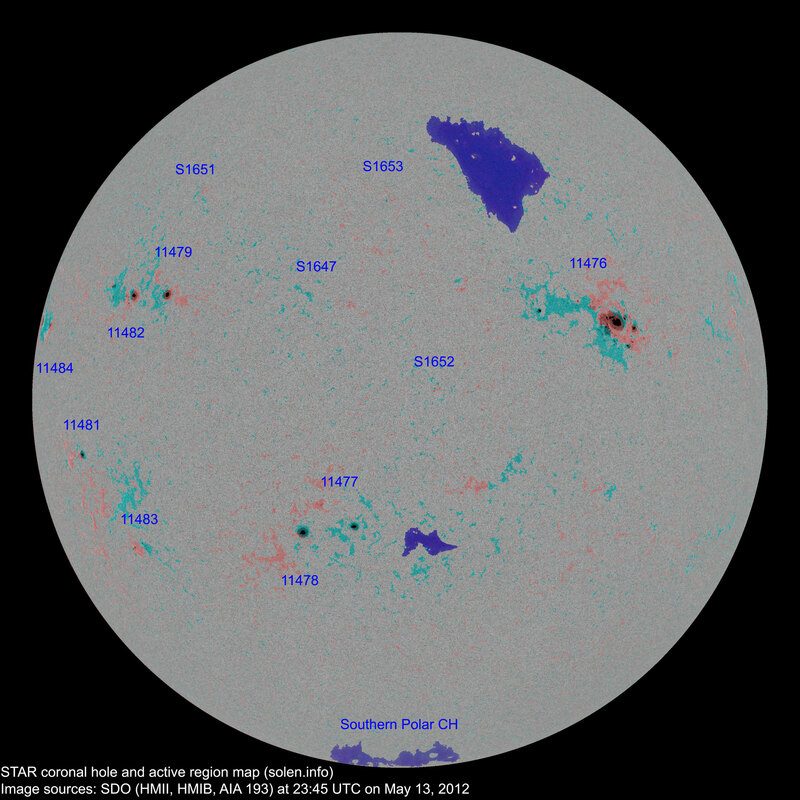 The geomagnetic field was quiet to active on May 13. 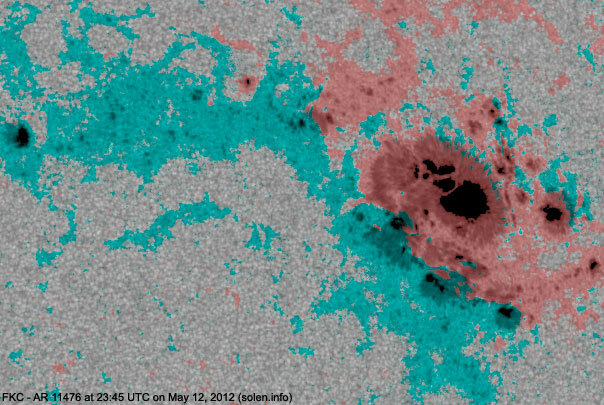 Solar wind speed at SOHO ranged between 443 and 540 km/s, likely under the influence of a high speed stream from CH516 most of the day. 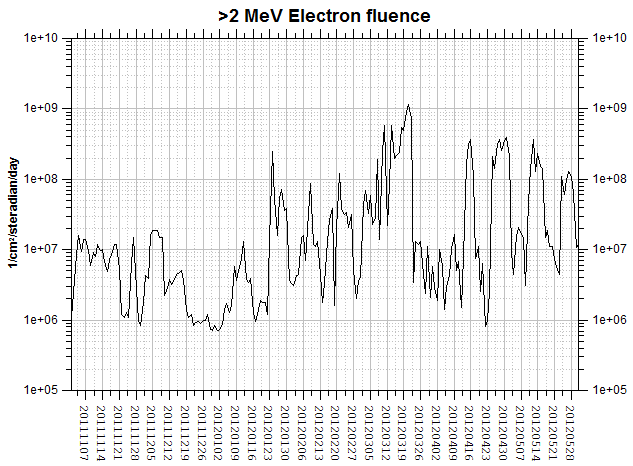 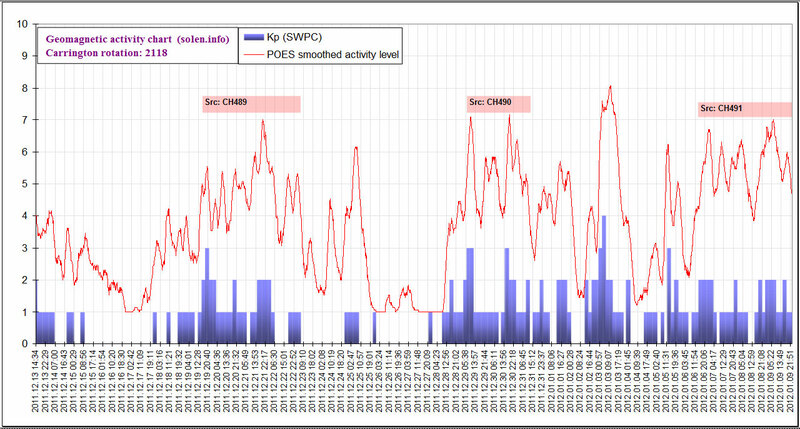 Solar flux measured at 20h UTC on 2.8 GHz was 130.5 (increasing 22.6 over the last solar rotation). 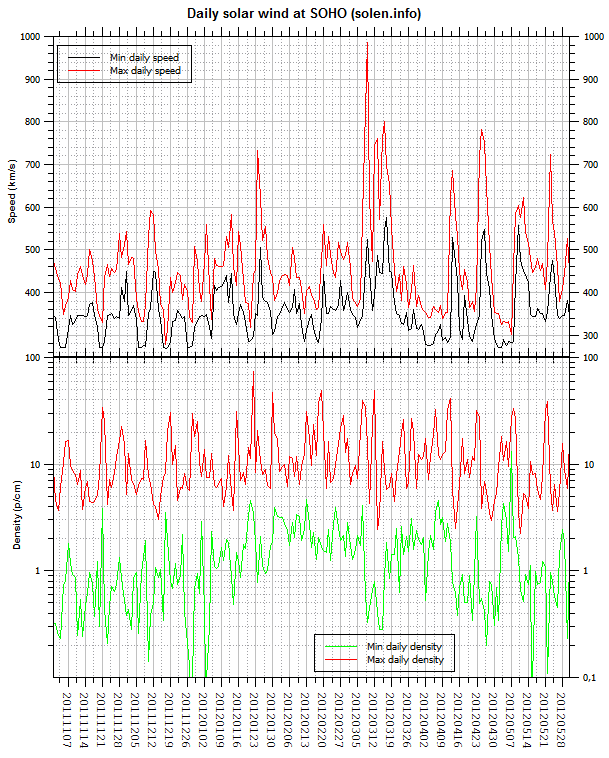 The Potsdam WDC planetary A index was 14 (STAR Ap - based on the mean of three hour interval ap indices: 13.5). 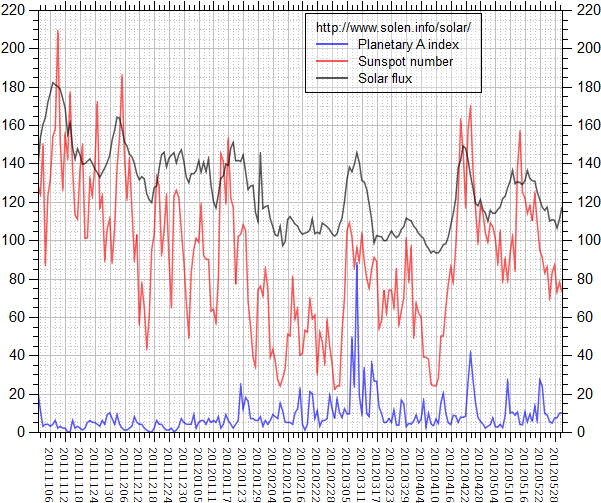 Three hour interval K indices: 34322233 (planetary), 33322233 (Boulder). 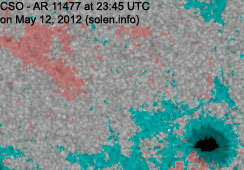 Region 11477 [S23E08] was quiet and stable. 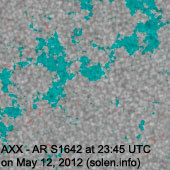 Region 11478 [S24E17] was quiet and stable. 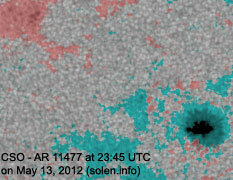 Region 11479 [N13E41] was quiet and stable. 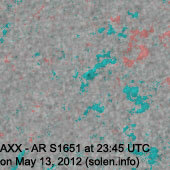 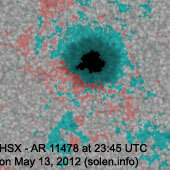 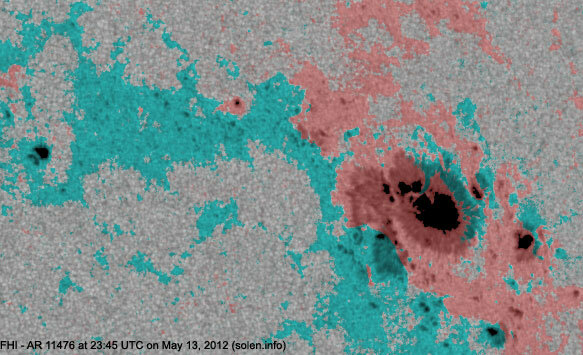 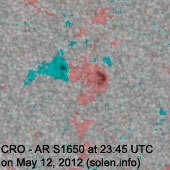 New region 11481 [S10E61] rotated into view at the southeast limb on May 12 and got an SWPC number the next day. 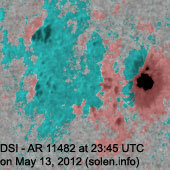 New region 11482 [N14E49] rotated into view at the southeast limb on May 11 and was recognized as an active region by SWPC two days later. 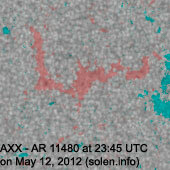 New region 11483 [S26E52] emerged near the southeast limb early on May 12 and was assigned a number by SWPC the next day. 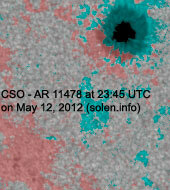 New region 11484 [N12E79] rotated into view at the northeast limb. 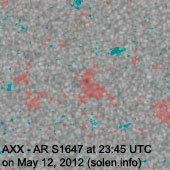 S1647 [N13E16] lost the leader spot and gained a spot in the trailing polarity area. 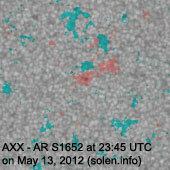 New region S1651 [N31E40] emerged with a single, tiny spot. 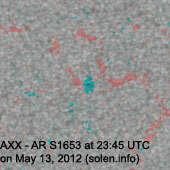 New region S1652 [S03W05] emerged near center disk with a tiny spot. 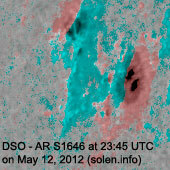 New region S1653 [N28E03] emerged with a tiny spot. 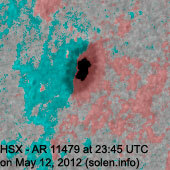 May 11-12: A filament eruption began after 18h UTC on May 11 and involved a large area around the center of the disk, including the southern part of AR 11476, AR 11480 and extending towards the east. 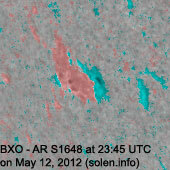 A CME was observed in STEREO-B at 23:54 UTC and in STEREO-A a couple of hours later when images resumed. 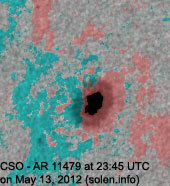 LASCO displays a slow and small halo CME. 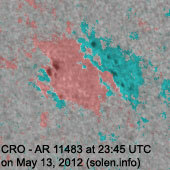 The CME is likely Earth directed. 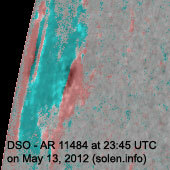 May 13: No obviously Earth directed CMEs were observed in LASCO or STEREO imagery. 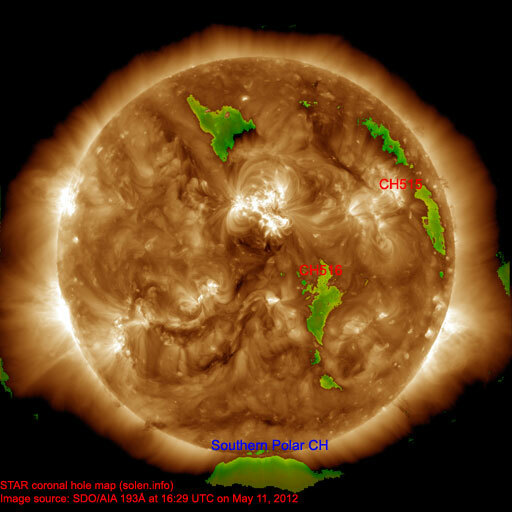 The geomagnetic field is expected to be quiet to unsettled on May 14 due to a high speed stream from CH516. 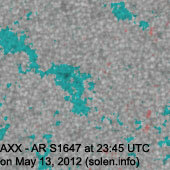 Quiet to unsettled is likely on May 14. 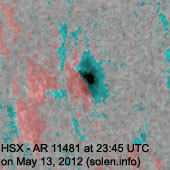 The CME observed late on May 11 / early on May 12 could reach Earth on May 15 and cause quiet to active conditions.